Raising-Rabbits is 3 Years Old! On November 17, 2009, Raising-Rabbits.com went live on the Internet with nothing more than a home page. Since that inauspicious start, we’ve strived to add information every single week. Over the last 156 weeks (3 years), we have added over 205 pages, plus our visitors have added many more. We’ve created a comprehensive section for pet owners - from bunny care and feeding to pet safe plants; from pet insurance to pets in the classroom; from a new pet checklist to DIY rabbit cages. We’ve gotten a great start at supplying extensive how-to pages for rabbit-farmers and homesteaders. After all, it’s great to find a website that gives you all the hard-to-find details and guidelines about raising rabbits and butchering them for the purpose of feeding the family. Raising your own food is a great way to know that the food on your table was treated humanely while it lived and that it died painlessly and quickly. If you’re interested in utilizing the pelts, no problem - Raising-Rabbits helps with tanning skins as well. We’ve been doing our best to support show rabbit breeders as well, those dedicated people responsible for the high-quality rabbits available around the USA, Canada, and the globe. 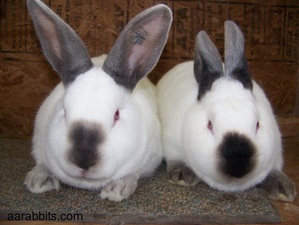 In addition to information on rabbit genetics, rabbit feed, and rabbit conditioning, we provide opportunity for show rabbit (and pet rabbit) breeders to list their rabbits for sale according to the state (or country) they live in. These are reliable listings that cannot be flagged for removal. Many of our visitors have taken the time to use our various comment forms and write their own ‘pages.’ Thank you! These interactions improve the success and the usefulness of our website for everyone. It is at least partly because of you that Raising-Rabbits.com has become a trustworthy source of rabbit information. visitors, and friends -- we appreciate you! We’re offering not ONE but THREE health tips in our 3-year anniversary issue! Late Fall and Winter in the northern hemisphere can be all kinds of cold, depending where you live. Rabbit does will safely kindle their kits through the most inclement of weather if you’ve provided sufficient protection from the elements and enough bedding to keep the tiny kits warm in their nest boxes. Even in sub-zero weather, under a heavy blanket of the doe’s fur the temperature in the nest box will measure 100+ degrees F.
On occasion, however, you might discover a one- or two-day-old kit outside the nest lying motionless on the wire floor of the cage with the body temperature of a popcicle. The doe may have accidentally dragged it out of the nest while it was still suckling. These tips for warming chilled kits might come in handy for one of your own kits, whether soon, like this winter, or throughout the year even during the warmer chilly evenings. Below: Kits and foster kits snug in their nest box. Since our last e-newsletter edition, we received comments from the owner of a male pet rabbit and the owner of a female pet rabbit. Though both of these animals were supposedly potty-trained, they are suddenly forgetting all their manners. While we understand rabbits fairly well, we’re not completely sure if we know all of the best ways to litter-box-train a rabbit. Do you know any tricks that have helped you train your male or female pet rabbit? Feel free to let us know! Write to us at rabbit_rhythm@raising-rabbits.com, or use the Contact Us form on the Raising-Rabbits website. Are oat kernels sharp and will they injure or lacerate a rabbit’s stomach or intestines? "Oats are generally considered to be the best grain... Whole plump oats are preferable to crushed oats as, with the latter, the rabbit will pick out the kernel and leave the husk" (de Blas, 2010). We recommend whole oats for both livestock and pet rabbits due both to the oil content and the longevity of the whole kernel. In the whole oat, the oils do not go rancid. They supply energy, essential oils with the fat-soluble essential vitamins A, D and E, and fiber, with relatively low carbohydrate. 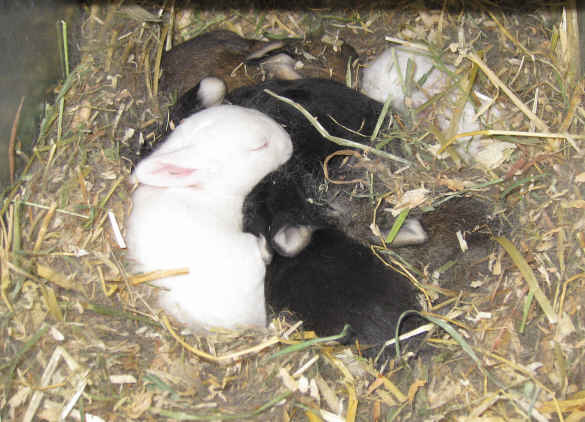 Your rabbit’s fur will take on a healthy sheen, its immune system will be strengthened, and nursing does will find the capacity to produce sufficient milk for the entire litter. Below: Show Quality Meat Rabbits from AA Rabbitry. "*****! Rabbits should NOT be farmed!" "Penny," a visitor to Raising-Rabbits, stumbled across the part of our website where we demonstrate for rabbit farmers the methods of killing and butchering livestock rabbits for the family dinner table. Um, she was not happy. A profanity-laced conversation ensued between Penny and two persons apparently known to her, Jon and Joe (all names are changed). Due to the language I could not clear her comments for public reading. But because of the courteous and able responses, we wanted to publish most of the thread on Raising-Rabbits with the profanity bleeped out. Read it at Rabbits Should NOT Be Farmed! 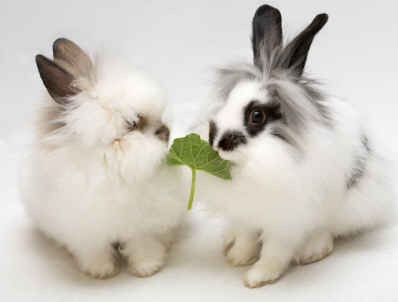 Your friends at Raising-Rabbits.com wish you a wonderful Thanksgiving and a wonderful December and holiday season.